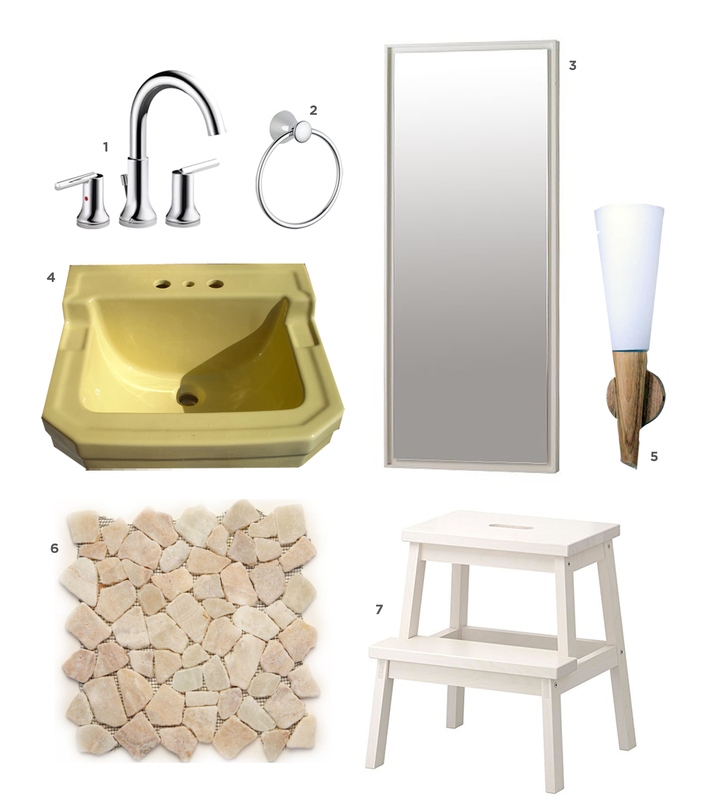 I’m so excited to finally begin work on our first floor bathroom this month! We ripped out the flooring and toilet last Summer, and have been hiking up the stairs every time we need to use the facilities. Yes, even through potty training. It’s been a joy. 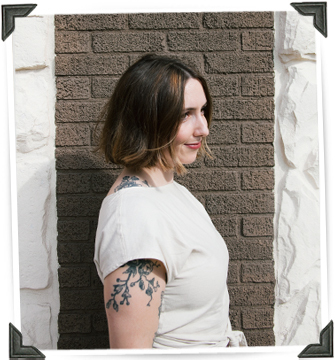 The good news about waiting a year to begin working on a space is that I get a year to plan, replan, and plan again! I’ve been through so many design options for this space, I’ve lost count! But I finally settled on three looks that I really dig. I’d love for you all to weight in on which option is your favorite! I love an eclectic interior, so this design appeals to me because of how it would blend together elements from traditional and modern design camps. That light and faucet? So deliciously modern. But the sink and mirror definitely harken back to the earlier decades of the 20th century. The tone-on-tone wallpaper, vertical shiplap, and checkered flooring would feel at home in any space, but combined, it feels so funky fresh! What do you think? A bit too much for such a small space? Or, go big or go home? 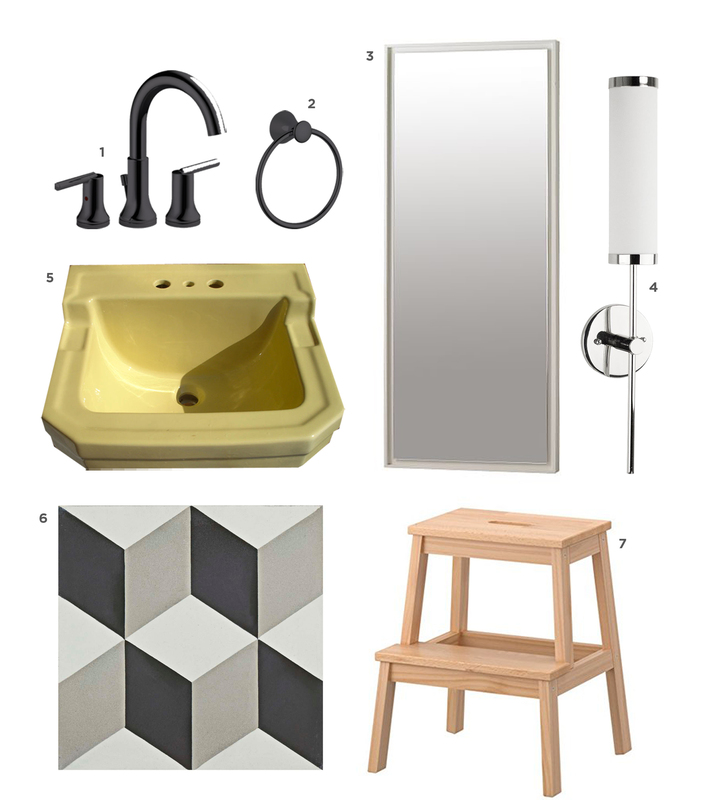 I was really gravitating towards doing a mosaic tile in here because there isn’t much square footage to deal with, and I love the grand impact a mosaic tile has been known to make in mid century time-capsule bathrooms. When I found this pebble tile that reminded me of miniature fieldstone, I was all about it. After making the mock-up seen at the top of this post, I was really digging the early minimal vibes that such a wall and floor treatment could bring to my tiny powder room. Pair it with a wood-tone torch sconce and a snazzy chrome faucet, and this mid century look feels completely updated! Do you think you’ll go crazy if I put this tile in so much of the room? Or do you think it will make a simple and significant statement? As I’ve revamped each room of our home, I’ve attempted to keep baseline elements of classic design. The lighting I selected for the kitchen, the moulding details, and the medium wood tones throughout the home felt a bit like an anchor that kept things from going a bit too trendy or modern. The sconces in this powder room design tie in with the chrome elements I have throughout the house, and recalls the subway tile I put in my kitchen. In general, this design feels sophisticatedly restrained, allowing the yellow sink to take center stage. But the tumbling block floor tile still reinforce the fun vibes introduced by the sink. Does this space feel too cold for you, or just the right restraint? Perhaps I’ll regret using ubiquitous subway tile yet again? We’re beginning clearing out the powder room tomorrow and having a plumber prep the space for drywall work and tiling. I can’t wait to get things underway in here! Tune in to my Instagram stories to check in on the progress for our powder room renovation. I love love love Option 3!! & regardless of what direction you go in, I think the black faucet is a necessity. Looks so amazing with the yellow. I agree, I love the contrast between the black faucet with with yellow sink. All three options are great, but I lean towards option 1! The warm hues from the wall paper, the shiplap (additional texture on wall like in other rooms), and the natural toned floor plays well with everything going on in your home. Excited to see what you decide! Also, I made my trip to Canton and used your recommendations! What an awesome city with so much character. 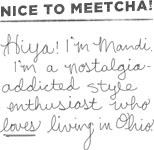 Everyone I met was so friendly and passionate about investing in the city. Very cool! Option 2 all the way! It blows all the current trends out of the water and I love how it relates to your fireplace! I love option 1! I feel like it’s just the right mix of funky and classic and would fit really well with the rest of your home. Option 2 please….Option 3 is a close runner up. Option 1 does not sing to me at all for whatever reason. Loving option 1! With number 3 you can’t go wrong also…hard choice! Love option 3!!!! Or option 1! Not a fan of the mosaic tile in option 2 but you do you! For what my two cents is worth ? I am completely ga ga over the mosaic, and it honestly isn’t even something I gravitate toward but it’s great. 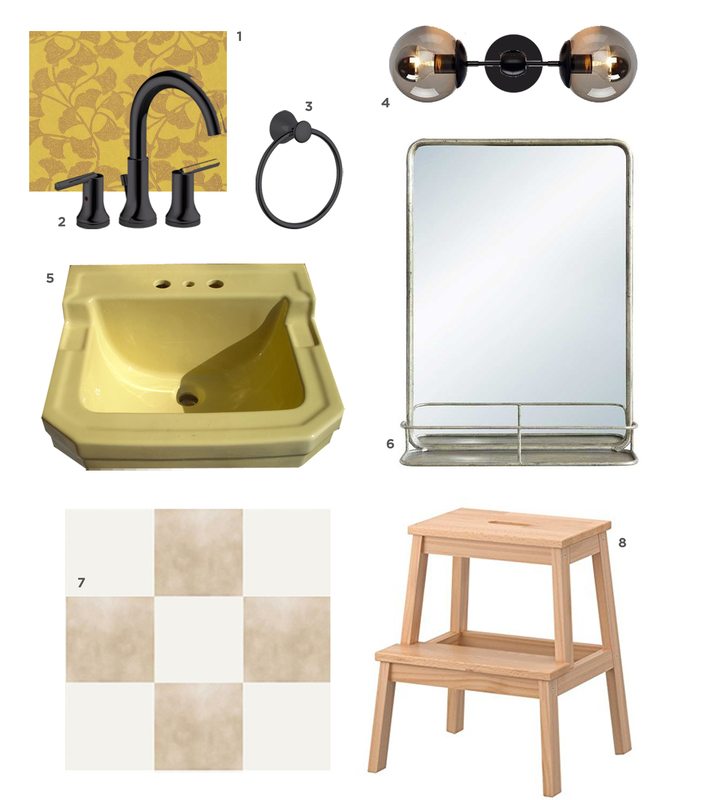 Here’s what I’d choose – mirror from opt 1, chrome faucet all the way with that yellow sink and I prefer the sconce lights from opt 3. ? Option 2! I love how it feels not overpowering for this small space but is not boring at all and how ties in with other spaces of your home (thinking of the fire place). I love option 1! I feel like it mixes all the right patterns/colors and elements. I feel like options 2 and 3 look great. #1 isn’t working for me but you make things look great so it’d probably look amazing if you did! Love love love option 3!!! 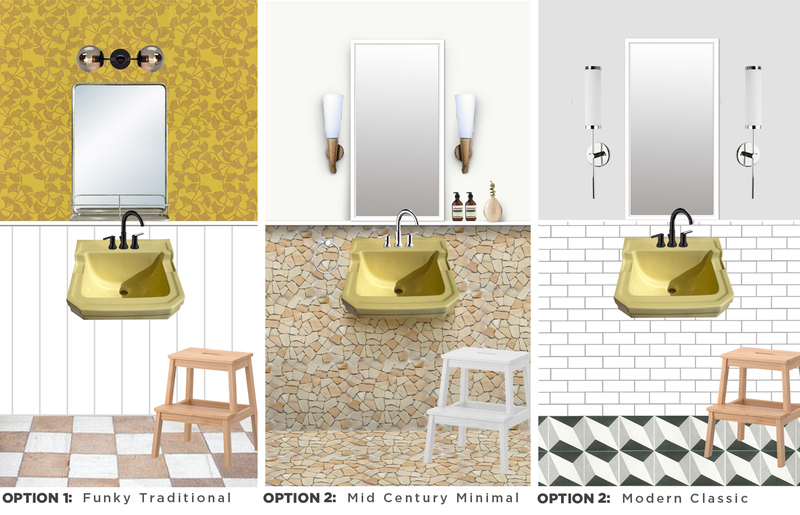 I absolutely love all three but I think that option three showcases the sink more than the other two, but I think you can’t go wrong with any of them! I love, love Option 2, it looks so like your living room and yet different. Echoing the stone fireplace is a lovely thought.